This evening I finally decided to make Pasta Prima's Heirloom Tomato, Basil & Mozzarella Ravioli that I picked up at Costco a couple of weeks ago. I didn't want to put anything on them to compete with the delicate flavors of the ravioli so I decided not to put any type of sauce on them. I diced 2 small zucchini, 3 small yellow summer squash and quartered a couple of handfuls of Cherub cherry tomatoes. 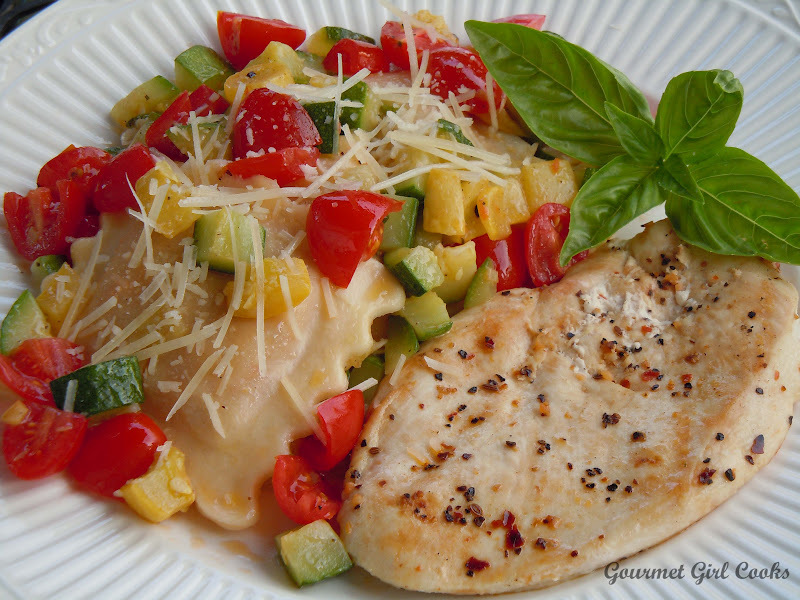 I sauteed the zucchini and yellow squash in a little bit of olive oil until tender while the ravioli was cooking. The ravioli actually only take about 4 minutes to cook...the longest part of the process is waiting for the water to come to a boil! 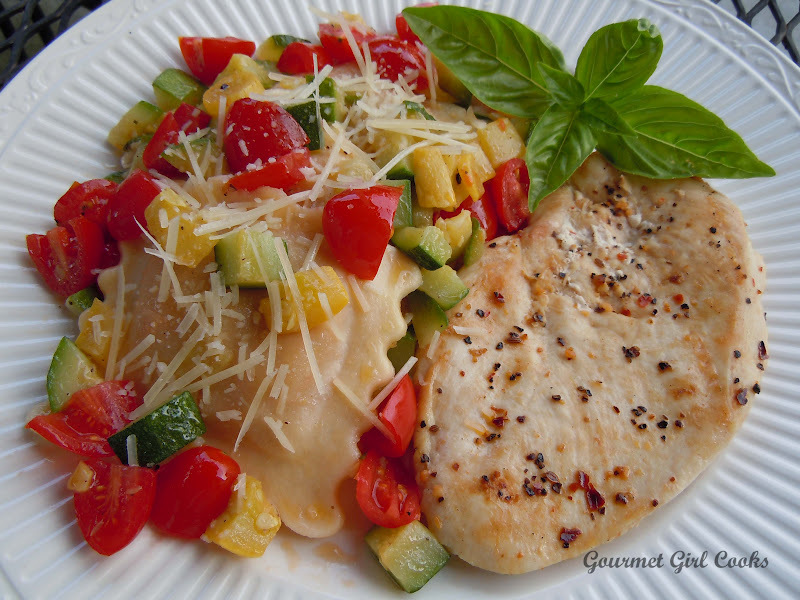 Once the ravioli were done, I drained and tossed them with a little bit of olive oil, added the cooked zucchini and yellow squash and then tossed in the tomatoes at the very end. I didn't want the tomatoes to cook, so I let them heat gently along with the hot ravioli so they would maintain their fresh flavor as well as their brilliant color. I added a pinch of sea salt, sprinkled on some cracked black pepper and topped with shredded Parmesan cheese. I served this delicious summer medley alongside grilled boneless chicken breasts (that were seasoned with some Spicy Montreal Seasoning). It was an absolutely delicious summer meal. The Heirloom Tomato-Basil-Mozzarella ravioli are very delicate and went perfectly with the delicate flavors of the zucchini, squash and fresh tomatoes....this meal screamed "SUMMERTIME". Both hubby and I enjoyed it. I would definitely recommend these ravioli if you can find them. Check out a couple pics of this beautiful and delicious meal below. Enjoy!